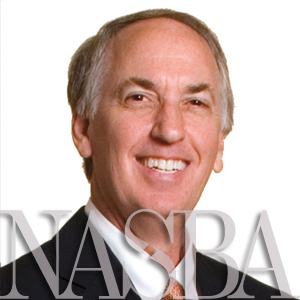 We continue our series on NASBA’s committees with a look at the Awards Committee. The charge of the Awards Committee is to recommend to the Board of Directors recipients of the NASBA Distinguished Service Award, William H. Van Rensselaer Public Service Award, and Lorraine P. Sachs Standard of Excellence Award. NASBA created the Distinguished Service Award to commemorate those who have demonstrated unswerving commitment and dedication to enhancing the mission of the National Association of State Boards of Accountancy. Since 1988, the William H. Van Rensselaer Public Service Award has acknowledged individuals who have earned recognition through their contributions in the development of a new program or improvement of a current program for Boards of Accountancy, or who influenced passage of rules or statutes to improve accountancy regulations and laws. Lorraine P. Sachs joined NASBA in April 1984, and was initially responsible for the examination administration program. The award that bears her name recognizes state board executive staff leaders who show excellence in regulation and make a positive impact on the accounting profession. Following a four-month Call for Nominations, the Committee reviews all nominations and identifies three finalists to present to the NASBA Board of Directors for final approval. Upon receiving final approval, each of the award recipients is notified. Award winners are presented at NASBA’s Annual Meeting, held in the fall of each year. This year, the Distinguished Service Award went to Andrew L. DuBoff, CPA, Diane M. Rubin, CPA earned the Rensselaer Public Service Award and Richard C. Sweeney, CPA, took home the Sachs Award. For more information about the 2013 award winners, take a look at this press release. To see a list of participating Committee members, please visit the Awards Committee page in the Committees section of this website. Also, for more information on NASBA Awards, please visit the Awards section of this website.